A World Rugby appointed judicial committee has removed a red card from the disciplinary record of France full-back Benjamin Fall after Saturday’s loss to New Zealand. Fall was sent off after in the 12th minute of the All Blacks’ 26-13 victory in Wellington after a mid-air collision with All Blacks fly-half Beauden Barrett, who was forced off the field due to concussion sustained from the incident. Red card for Benjamin Fall. The 29-year-old was ordered off the field under Law 9.17 for tackling, charging, pulling, pushing or grasping an opponent whose feet were off the ground. In accordance with World Rugby’s disciplinary process, Fall’s red card hearing was heard by an independent judicial committee comprising Adam Casselden (Chairman), David Croft (Ex-Australian and Queensland Reds player) and John Langford (Ex-Australian, ACT Brumbies and Munster player). Having conducted a detailed review of all the evidence available, including all video footage and additional evidence from the player and submissions from his legal representative Aaron Lloyd, the Independent Judicial Committee dismissed the red card issued by the referee. The independent judicial committee found: “As demonstrated in the video footage, the player, at all times, had his eyes on the ball whilst it was in the air, which showed, in our opinion, a clear intention, on the part of the player, that he intended to contest it. “From the moment the ball leaves France number 10’s (Anthony Belleau) boot the player (Fall) is observed running a line at pace to a position which he believes will put him in the best possible position to catch it. The line that the player is running is then altered by his collision with New Zealand number 13 (Anton Lienert-Brown). 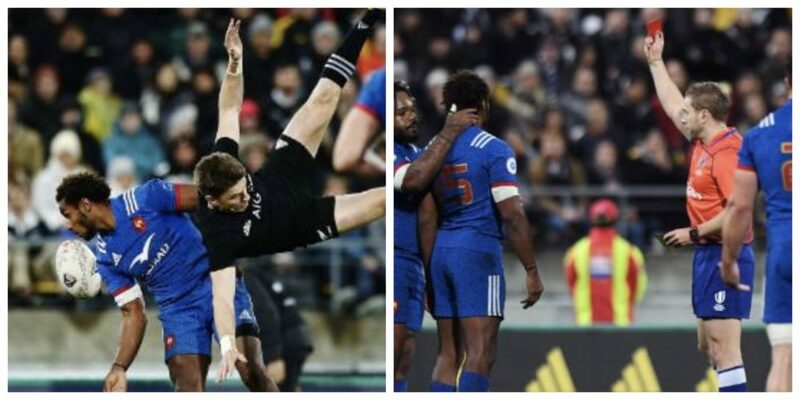 This collision then causes the player to lose his balance, stumble and be propelled or pushed towards the path of New Zealand number 10 (Beauden Barrett). By reason of those matters the player’s attempt to contest the ball was compromised. “In our opinion, the direct and proximate cause for that outcome was the result of the player’s collision with New Zealand number 13. As a result of his collision with New Zealand number 13 the player was denied the time (less than 1 second) and the space to put himself in a position to avoid a collision with New Zealand number10 or to contest the ball as he had initially planned. “Whilst it is unfortunate that New Zealand number10 sustained a concussion after landing on his head, was removed from the match and is unlikely to be available for the third Test match we did not consider that the player’s actions, in the circumstances of this case, were deliberate or reckless. “In our opinion, as supported by all the video footage, the player’s actions were accidental as they were brought about by his collision with New Zealand number 13, the effect of which changed his initial running line thereby pushing him towards New Zealand number 10. “We did not consider that the player would have foreseen the events, which ultimately unfolded, and therefore could not have, in our opinion, given the speed of the events and the dynamics at play, taken any preventative steps to avoid the collision with New Zealand number 10 or to have put himself in a position to contest the ball as he had initially planned. “Therefore, having regard to the totality of the evidence, the judicial committee was satisfied, on the balance of probabilities, that the referee’s decision to issue the red card was wrong. In reaching that conclusion, it is important to record, that no criticism is made of the referee nor, in our opinion, would any be warranted. “Unlike the referee we had the benefit of all the video footage, which showed various angles of the incident. Unlike the referee we had the luxury of time to deliberate and consider, in private, the incident. In contrast, the referee was required to make his decision in a matter of minutes in the full gaze of the public and without the benefit of all the relevant material. As they say, they had more time than the TMO. They might be right.